In our continuing discussion about improving email and other digital communications, we had to share how one locally elected official’s Facebook rant made him a top-trending topic and punching bag on Twitter; a source of numerous memes, like the one here, and the subject of unflattering coverage in media around the country. Kirby Delauter, a Frederick County, MD councilman, told Frederick News-Post reporter Bethany Rodgers, in a Facebook exchange, that she was not authorized to even use his name in her news accounts. If she continued to do so, he threatened to sue her. Obviously, an elected official cannot sue over the use of his name, nor does any reporter need authorization to use the official’s name in a story. 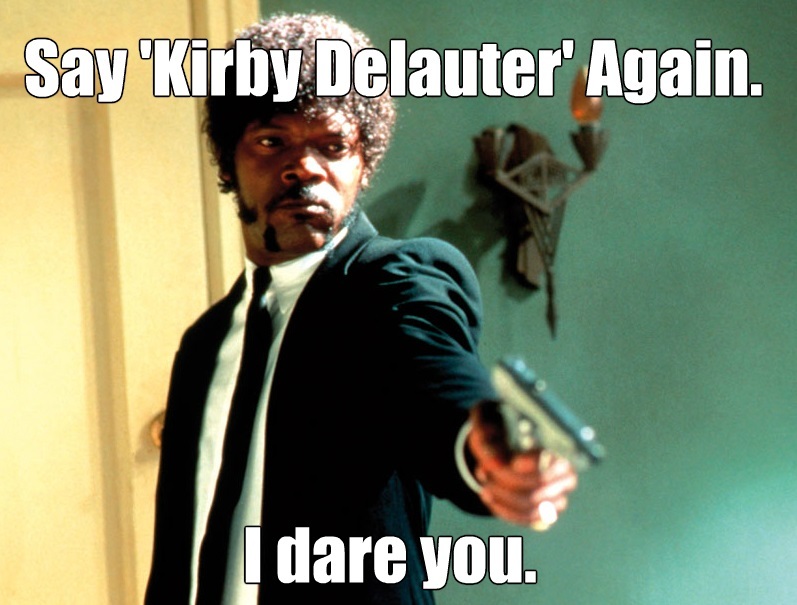 So now, Delauter is trying to recover with an apology that his threat was “wrong and inappropriate.” . Noteworthy in his apology is his admission that he has “fired off my share of angry emails, which in hindsight I wished I hadn’t. I can’t think of one that had a positive effect.” He did even worse than that in this case. He posted his message on Facebook where it could be widely seen. An email, at least, couldn’t be re-posted — unless the reporter had chosen to share it. What he has learned is that he can’t stop a reporter from using his name. And we hope he has learned that he can avoid further damage to his reputation by using a “cooling off” period and following some of the other steps we’ve recommended in previous posts on email etiquette. As a footnote, please see the Frederick News-Post editorial on the councilman’s original comments. It’s one of the best we’ve seen. The text was supposed to only go to about 4,000 Jewish members. Nearly 12,000 people responded. Most were confused. Some were offended, and some sent racist comments. The playlist included songs, like “Apologize” and Cher’s “If I Could Turn Back Time.” One in three of the people who received it, clicked through to listen. As the organization noted in its blog post, it wanted to give something of value — at least entertainment value — to the people it may have offended. Given that its audience is people 25 and younger, a playlist was perfectly attuned to the very audience it needed to reach. DoSomething.org quickly and effectively devised a simple and elegant solution to this mistake that could overcome the anger triggered by its original text and leave recipients with a smile on their faces and a song in their hearts. Great blog post by Scott Morris, who is leading the LA Team for the JDRF Ride for the Cure. Please read and get ready to join us in the 2015 Ride for the Cure! 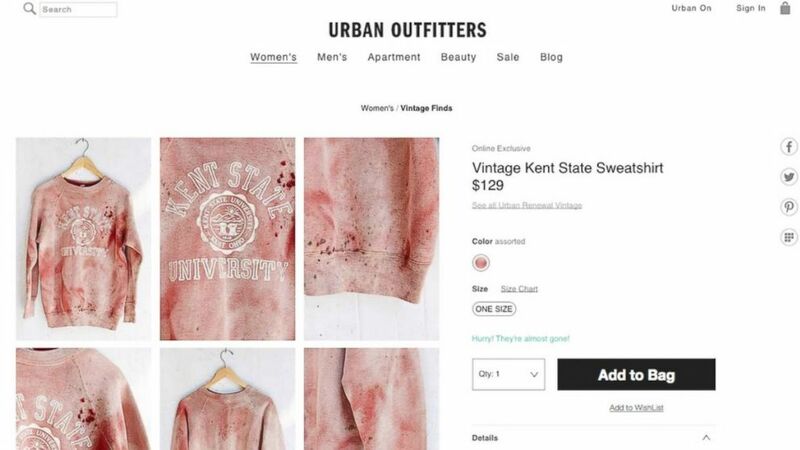 Urban Outfitters made a big mistake when it marketed this red-stained sweatshirt because it evoked the 1970s shootings on campus of Kent State students. Credibility is a hard-won attribute in today’s fast-paced and multi-dimensional communications landscape. Thorough editing, fact checking and reviews by multiple levels of people within a company or organization will help guard against mistakes. But when they do happen, the challenge is retaining the organization’s credibility in handling the mistake. With a 24/7 news cycle, quick but measured responses are essential to successfully navigating mistakes ranging from a mere gaffe to a major crisis. If it’s a simple mistake, a simple correction may be all you need. This could be an updated press release, a call to a reporter to correct misinformation or a Tweet or other social media post. The Detroit Free Press, for instance, accidentally used football coach John Harbaugh’s photo on a story about his brother, Jim Harbaugh, who is also a football coach. The editors won over Twitter followers by using humor in their correction. The paper posted a series of tweets, expressing its embarrassment and featuring short video clips, or GIFS, that showed a kid hitting himself in the head with a yo-yo and other characters embarrassed by their mistakes. The humorous approach won over followers, as USA Today reported here. Serious mistakes that lead to loss of reputation and/or harm may require pro-active solutions. In addition to taking responsibility and apologizing, saying how it will avoid the same mistakes in the future will help a company or an organization recover its reputation and credibility. This past year, the National Football League’s handling of the domestic abuse case involving Baltimore Raven running back Ray Rice demonstrates how failing to provide a pro-active remedy quickly can lead to more days of negative coverage than the story might otherwise get. The NFL and the Ravens failed to adequately investigate the original abuse allegations and failed to pro-actively address their failings when the explosive video of Rice hitting his wife aired on TMZ and other media outlets. Moving quickly to admit their mistakes and outlining a pro-active NFL domestic abuse prevention program would have helped turn the tide of the coverage from their failings to their new determination to address one of the sport’s major problems. What advice would you have for correcting mistakes? The 2004 Asian tsunami swept this fishing boat onto a two-story home. It remains there as a museum exhibit of the power of the tsunami. Two years ago, the deadliest tsunami in recorded history ripped a 40-foot fishing boat from its moorings and deposited it on a house nearly half a mile away. 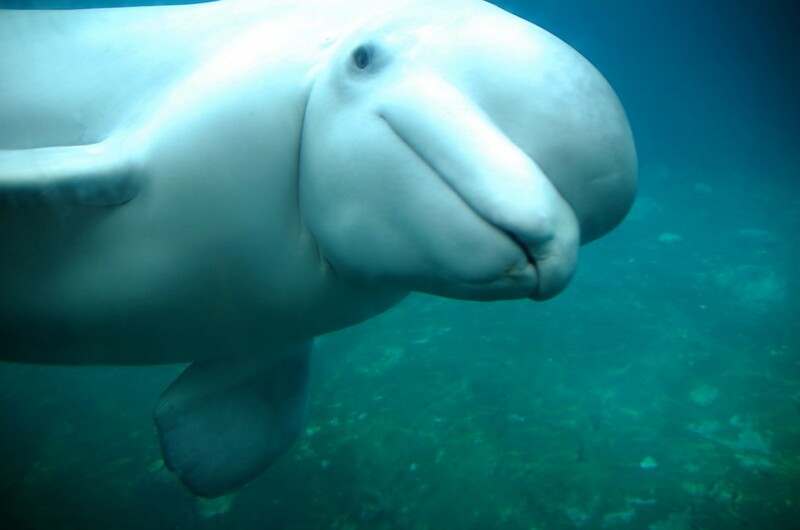 It became their refuge when a wall of water swept through their neighborhood early on the morning of Dec. 26, 2004. By their count, 57 people ages 4 months to 90 clambered aboard this modern-day Noah’s Ark and safely rode out a flood of biblical proportions. The aging matriarch invited me onto her porch to cool off from the work I was doing as one of five Southern California women using our vacations to help tsunami survivors. We had arrived here worried about our safety and our reception in a Muslim stronghold that had been virtually closed to Americans before the disaster. We left 10 days later, unharmed and uplifted by the generous hospitality of Bsyariah and others, their strength of spirit, and the good we saw coming out of this tragedy. “To hear people say they were blessed to be here and for them to have an attitude of thankfulness was amazing,” said Marilynn Allain, one of the women I traveled with to Indonesia. Banda Aceh, the provincial capital we visited at the northern tip of Sumatra, was the closest city to the epicenter of the 9.3-magnitude earthquake that triggered the tsunami two years ago. Nearly 167,000 people died or went missing in Aceh province. A quarter of the population lost its livelihood, 500,000 lost their homes and 2,240 schools were destroyed. Allain, Becky Grassl, Sheri Walsh, Cynthia Bates and I signed up to help them when our Manhattan Beach church, Journey of Faith, asked for volunteers to work with a Banda Aceh Christian relief organization. But I almost canceled my trip when I read State Department warnings telling Americans to avoid Banda Aceh because of the possibility of terrorism and armed conflict. Since 2002, the State Department reports, 248 people have died and scores more suffered injuries from terrorist bombs in Indonesia. A brutal, 29-year civil war had taken an estimated 15,000 lives in Aceh province and kept out most of the rest of the world. The tsunami brought peace to Aceh. But Aceh remains extremely conservative. It is the only Indonesian province where Shariah, or Islamic law, is enforced. Before arriving here, we received stern warnings to be careful because Sharia prohibits — among other things — alcohol consumption and Christian evangelism. We stayed with a missionary family in the Banda Aceh home of our host organization, Indonesia Bangkit Bersana. The organization’s leaders insisted that an interpreter accompany us in public to avoid misunderstandings. It was a good thing because one man we encountered told our translator, Lydia Suharni, that he hates Westerners and Christians. He said he believes his Muslim leader’s teachings that the tsunami was God’s punishment for the Acehnese who adopted Western ways. Our hosts also required us to wear traditional Muslim garb as a sign of respect. Even so, Acehnese men made rude comments, gestured and, in one case, followed us along the streets. Seeing an American in person is still such a rarity here that people often shouted “bule,” their word for Westerners, when we passed by. I had expected some unpleasant encounters. A Pew Research Poll conducted before the tsunami found just 15 percent of Indonesians had a positive opinion of the United States. But it also found that American aid is helping to turn the tide. A year after the tsunami, the same polling organization found that 38 percent of Indonesians had a positive opinion of the United States and 79 percent said their view of America had improved because of the relief efforts. 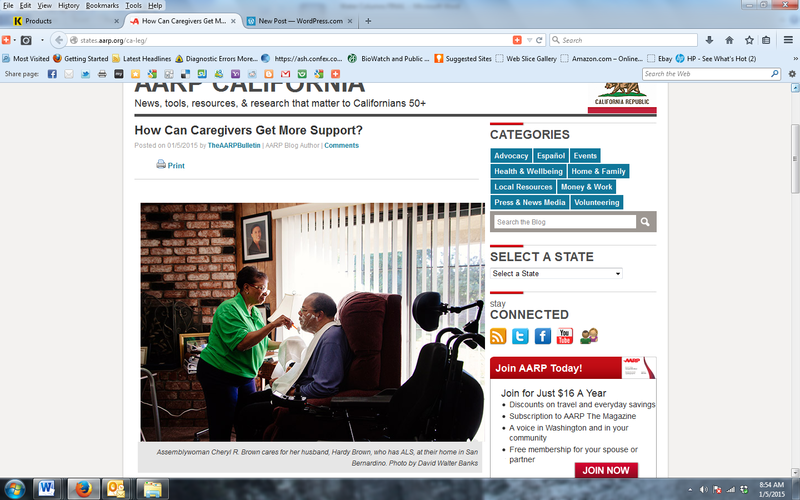 By going there, we hoped to contribute to these changing attitudes while helping with the recovery. “Instead of just hearing from their leaders what Americans are like and seeing it on TV, now they have actually seen Western people there,” said Grassl. Many residents came out to watch us — the sweating, red-faced “bule” — working under a blazing sun to haul away buckets of muddy salt water and debris the tsunami had left in their neighbors’ wells. Some of the women, like Bsyariah, took pity on us and invited us onto their porches to cool off. One family invited us to their housewarming party, and a few were so welcoming that they invited us to stay in their homes. In another neighborhood, a group of 21 women showed up at a moment’s notice for a class we held on making braided rag rugs, an American skill that the women hope to turn into a home-based business. At a kindergarten where we taught crafts and took photos to replace ones lost in the tsunami, the children thanked us with their highest sign of respect. They pressed the backs of our right hands to their lips and then to their foreheads. In the remote village of Poroy, the principal and teachers took us on a picnic at their local waterfall as a thank-you for teaching them. The tsunami washed away the school building, killing 55 of its 98 students, the principal’s wife and one of his two sons. The principal, Abubakar, conveyed these facts without rancor and, like many others we met, expressed thankfulness for his survival. “There was pain, but there was a glimmer there of hope and joy,” said Allain, a member of our team. In one of Banda Aceh’s hardest-hit neighborhoods, a sad-eyed boy seemed only wistful as he recounted the decision by his family to ignore his warnings to flee the tsunami. Syahrul Ramadhan said through a translator that he was at a friend’s house when he heard people yelling for their neighbors to run from the water. He ran home to tell his family and then fled to safety at a neighboring two-story house. He said his family listened to his father, Ahapradul Umam, who urged them to stay at home. His mother, three sisters and two brothers died. “I don’t know what they were thinking,” the 13-year-old said. Umam, the only other member of the family to survive, said he doesn’t know how he managed to avoid drowning in the three waves that swept away his home and family. But he said he does know that God kept him alive to raise his one remaining child. Two blocks away, Abdul Wahid, a father of three, showed no anger as he described his Job-like life since the tsunami. He lost his home, two rental houses and his job at a nearby fish market. He and his wife were living in a refugee camp. Their children were two hours away in another village where they could attend school. He said he alerted his family and neighbors of the oncoming wall of water, and more than 100 took refuge on the roof and upper floors of the neighborhood’s tallest house. The homeowner, Idaman Sembiring, and his family are Christians, while most of their neighbors are Muslim. Despite decades of conflict between the two religions, the tsunami swept away their differences. In April, the Sembiring family held a thanksgiving party to celebrate their survival and their return to their recently rebuilt home. They invited their Muslim neighbors and us to join them. “It is a thanks to God for giving us life and a thanks to the people who care about me and my family,” said Eliyani Ginzing, the homeowner’s sister. More than 95 percent of Aceh’s population is Muslim, and she said Christians often experienced discrimination before the tsunami. 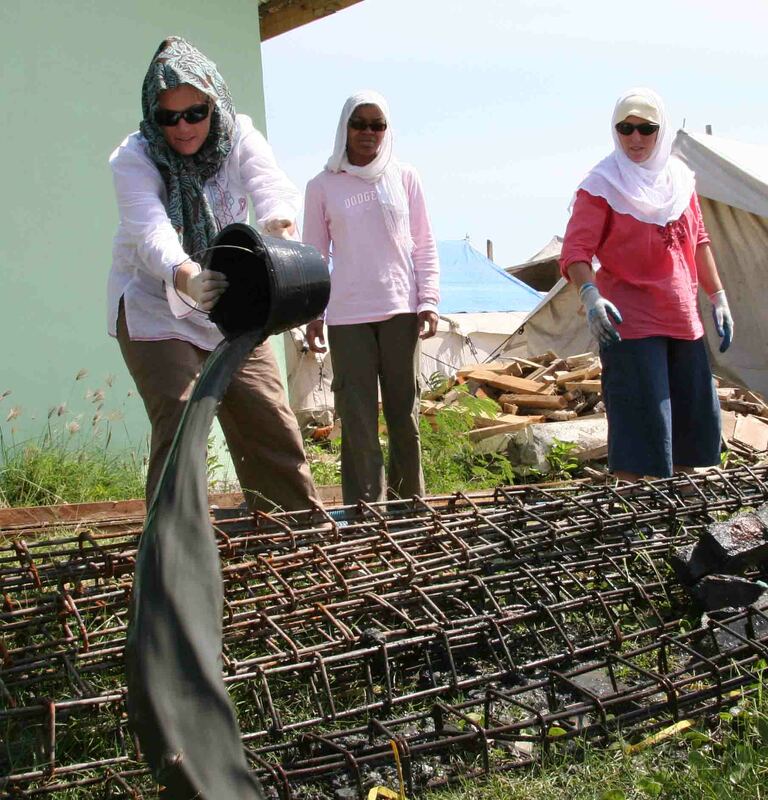 After the disaster, she said, Christians faced fewer problems. The tsunami also brought peace to the politically unstable region for the first time in 29 years, and it opened the door to Westerners and Christian organizations for the first time in a generation. Thousands of aid workers have come here, and people around the world have pledged $8.9 billion to rebuild the region better than it was before. While much more must be done, I left Banda Aceh thankful for the mostly warm welcome we received, humbled by the strength of its people and inspired by the good that is coming out of tragedy. I hope one day to return and find that the help we provided and the aid from around the world has made Aceh a better place than it was before the earth shook, the waters rose and a boat appeared on dry land.